The many benefits of babywearing, both physical and emotional, are well documented, yet for parents of babies with hip dysplasia it isn’t always straightforward. In this situation finding suitable baby carriers for hip dysplasia and understanding the correct positioning becomes incredibly important. Hip dysplasia affects between 1 and 2 in every 1000 babies and can lead to serious issues in later life, such as hip pain or osteoarthritis, yet up until now there has been very little research on the impact of incorrect positioning while babywearing. 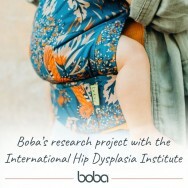 In a bid to put this right, Boba has joined forces with the International Hip Dysplasia Institute (IHDI) and doctor of orthopedic surgery, Dr Erin Mannen, to conduct research at the University of Arkansas to better understand the relationship between babywearing, hip dysplasia and spine development. It is hoped that this project will lead to a greater understanding of how babywearing impacts on a baby’s biomechanics. Hip dysplasia occurs when the ball and socket joint of the hip does not form properly. This means that the ball at the top of the femur doesn’t sit properly in the socket and so the hip joint is loose and unstable. In extreme cases the femur can come completely out of its socket. Thankfully most cases are picked up early, either at the newborn examination straight after birth, or at the 6 week check up. Babies that need treatment have to wear a special harness called a Pavlik harness, which keeps their hips in a stable position and allows them to develop as normal. The harness is worn for several weeks until the joint is stable. If the hip dysplasia is detected when the child is older, or the harness doesn’t work, then surgery may be required. All babies benefit from being held close to the calming, soothing influence of their parent or caregiver, however this is even more true of children undergoing the intensive and often uncomfortable treatment for hip dysplasia. In this instance, finding suitable baby carriers for hip dysplasia is vital, not just for the emotional well-being benefits, but to ensure that the lengthy treatment is not jeopardised by incorrect positioning. While hip dysplasia can occur at any age, the hips develop most rapidly during the first six months of life, and so it is important that very young babies are correctly positioned in order to prevent any hip issues becoming worse. Although there hasn’t been a lot of research in this area (until now), it is known that the most ergonomically sound position for healthy hip development is the ‘M’ position in which the baby’s knees are higher than their bottom and the legs are spread apart. This ensures that the femur head is centered right in the middle of the hip socket. It is still not known just how far from the ideal ‘M’ position you can stray without exaggerating existing problems. In fact this is just one question that Boba and the IHDI want to answer. It is therefore important that during these crucial early months the correct baby carriers for hip dysplasia are used which will enable the baby to adopt the ‘M’ position. As well as this understanding of the ideal positioning for healthy hip development, it is known that bringing the legs together, or allowing them to dangle without adequate support between the thighs, can cause the hips to be pulled away from the centre of the socket and can worsen hip instability considerably. Likewise, if a baby is swaddled for extended periods of time with their legs together and straight, this can also harm healthy hip development. What will this research tell us about using baby carriers for hip dysplasia? To allow normal development it's important for young babies to be able to move and use their muscles. By researching just how they move in different scenarios Boba and the IHDI will be able to help parents to safely care for their children and make appropriate choices. Whilst Boba is mostly focussed on carriers and promoting healthy babywearing, this work has wider implications for babies and parents. The results of this research will also provide a better understanding of babies' movement and positioning when using car seats, pushchairs and bouncers. With a deeper appreciation of the biomechanics, Boba are hoping to improve their knowledge about baby carriers for hip dysplasia so they can help and support families dealing with the condition. There is also the scope to research other musculoskeletal issues and to discover whether specific positions improve or worsen these conditions. The initial results from this research project show that it does matter how a baby is positioned in terms of motion and muscle activity. However, it is still not known just how significant it could be. Through their passion to improve the lives of parents, all Boba Carriers are already labelled as ‘hip healthy’ by the IHDI and, as a company, they have made great progress in promoting the benefits of babywearing for all families. By participating in this pioneering research project they are ensuring that all parents and caregivers are empowered to make informed choices about the positions that babies are exposed to and instill the confidence to be able to choose the correct baby carriers for hip dysplasia.